Thank you to everyone who could join us at the University Council for Education Administration in Houston, Texas, November 14-18. FLDC collaborative members Aditi Rajendran, Dr. Ann Ishimaru, and Dr. Muhammad Khalifa along with systems levels leaders and part of the UW Leadership for Learning (L4L) cohort Dr. Kelly Aramaki (Bellevue Public Schools); Dr. Justin Irish (Edmonds School District); Dr. Luisa Sanchez-Nilsen (Tulalip Tribes), and Dr. Keisha Scarlett (Seattle Public Schools) presented a critical conversation around codesign within school systems at the 2018 UCEA Convention. 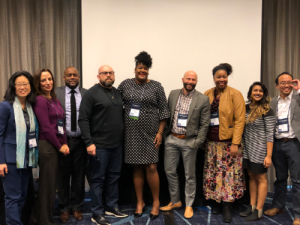 Their paper explored the development of equitable systemic leadership practice through examples of district leaders’ codesign processes with minoritized families and communities in four educational contexts.